My Eureka moment!! | Edimentals ! 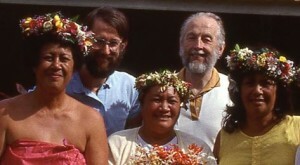 This is the moment I had the idea of multi-species flowery salads – November 1989, Rarotonga, the Cook Islands :) (with Professor Johannes Falnes and some of the local talent)! We were there to hold a workshop on ocean wave energy for participants of 6 island nations in the Pacific. Little did I know that 25 years on I would be known as the Extreme Salad Man….